Myelodysplastic syndromes (MDS) are considered to be stem cell disorders. A number of cytogenetic abnormalities have been demonstrated in these patients. 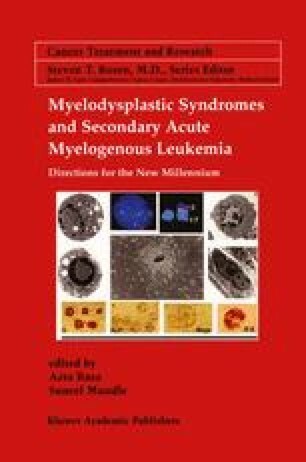 In the last decade it has become apparent that besides the cytogenetic and molecular abnormalities at the individual cell level, the global alterations of the bone marrow (BM) microenvironment brought about by shifts in the cytokine milieu may play a crucial role in defining the pathobiology of these disorders. The combination of factors produced by adherent stromal cells and hematopoietic cells constitute the web of cytokines meshing a variety of biological processes including survival, proliferation and differentiation of the hematopoietic cells. Imperatively thus, hematopoiesis in these patients is a result of a critical balance between the stimulatory and inhibitory signals transduced by these cytokines. Primarily effects of these cytokines could be chemotatic, stimulatory or inhibitory to hematopoiesis.